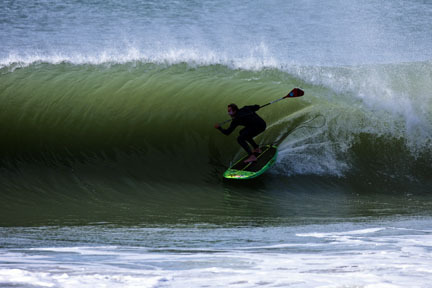 I was still buzzing from my Cortes Banks Dream trip and could not even think about sleep, so I zipped home, switched out a couple SUP boards for smaller surf, checked the buoys and decided to continue my SUP mission with a 2 hour road trip up North…….. 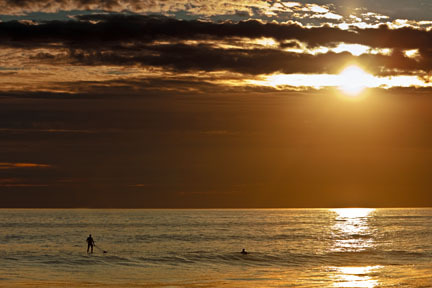 I called my good friend, renowned surf photographer Dave Puu as I was driving into Ventura around 5:45 am . 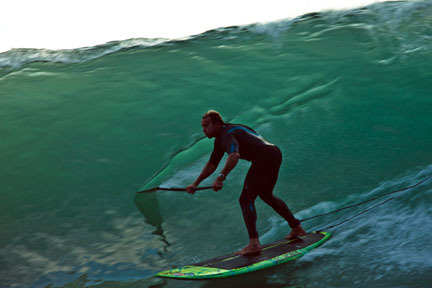 He never misses a sunrise with a swell in the water. We met up at one of the local beach breaks to check the conditions of the surf and 5 minutes later had a game plan and hit the road. When shooting with Dave, your always searching for artistic perfection and when the conditions don’t seem to be all time, you still hit the water knowing that Dave’s keen eye always finds the magic. We checked a couple more spots and finally settled on what I call “the studio”. Surf was a couple feet over head with a bone chilling 15 mph offshore breeze. I suited up and grabbed my 8’6 Hobie SUP board and hit the water. We worked a dredging Right handed sand bar that offered up a couple long draining spitting tubes with it’s fair share of close out beatings. Three hours later we were ordering breakfast at The Cajon Cafe exchanging stories of the morning goods and setting up for the afternoon plan of attack. With the tide dropping and the swell slowly on the decline; we took a gamble and headed South towards Malibu. The boys shared a local low tide sand spit that throws a backwash wave into the in coming set creating a super steep, square , grinding, wedge of a tube that peels right down a rocky point. Dave suited up and swam out with his water camera to get a different view of the action. We managed to beat the crowd and score a couple really fun back wash bowls before the welcoming comity swarmed the peak. setting up for the take off was super challenging, but well worth the rewards..
We dried off and headed South once again checking several points on the way and finally stopped shortly before sunset at a small point beach break. Nothing really enticing to motivate the crew, so they called it a day as Dave and I contemplated one more go out in hopes of capturing some of the mystical sunset that lit up the inside section of the point. I quickly raced down the rocky cliff and paddled out catching wave after wave as the sun slowly set behind the dark ominous clouds. I rode my last wave in with the biggest smile on my face, knowing we had scored once again finishing the day with another epic sunset. There’s nothing more satisfying then hearing Dave say “that we really killed it today”. “What a great way to end my 48 hour wave crazed treasure hunt.” I packed up my truck, said my goodbyes and started my long journey home. Stay tuned to another wave filled adventure coming soon….. Liked reading about your trip and wanted to let you know the surf has been good up here in the Ventura area worth the drive. Check Silver Strand It’s been good sweeping.